Imagine, for a moment, that Achilles decides to step through Zeno’s sequence of points. Right foot first, then left, every point along the way. Towards the end, we find him shuffling rapidly towards the doorway. Everything else is otherwise the same – he takes half a second to reach point 2, another quarter of a second to reach point 3, and so on, throughout the sequence. Of course, we could simply think in the normal way, with Achilles walking steadily towards the doorway, but many gravitate to this alternative mode of thinking, especially when contemplating the problem in slow motion. 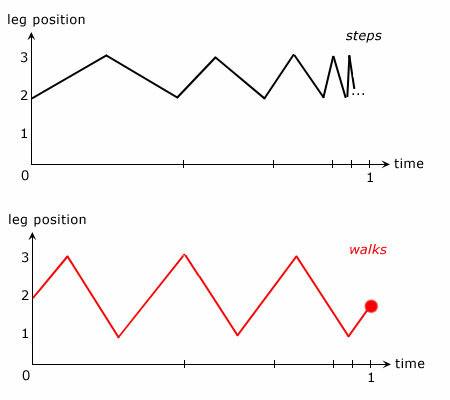 Assuming that Achilles can hop, step or shuffle sufficiently fast, the problem seems unchanged, since the essential thing is that he moves from point to point in the required time, and not how he does so. Indeed, one thinks that he may even pause briefly at each point, so long as he gets to the next one in time. Unfortunately, however, these natural thoughts are disastrous, because in redrawing the problem this way, we unwittingly reduce it to the case of the man and the pie and open ourselves up to the awaiting bodily disjoint! Thus, after exactly one second, Achilles is at the doorway. But which foot does he have forward? And why? Or if he is hopping through the points, is he up in the air or down on the ground at the instant he crosses the doorway? As we know, no answers are forced upon us. All answers are permitted. So let’s suppose he has his right foot forward when he reaches the doorway. It will then be disjoint from its prior states of motion, in the way previously explained. And so we must imagine Achilles “popping out” of Zeno’s sequence after exactly one second in some random bodily state disconnected from his previous ones, and being perplexed over how that can be. In contrast, if we imagine Achilles walking towards the doorway in the normal way, the difficulty simply does not arise. His body and limbs will transit past the doorway as smoothly as his center of gravity does, and no disjoint of the sort in question will surface. So the Achilles hop, step or shuffle is not as innocuous as it first looks! On the contrary, it is quite disastrous to redraw Zeno’s problem in that way. If Achilles just walks in the normal way, the dreaded bodily disjoint will not arise. We need not worry about whether Achilles can get through the doorway with one of the alternate gaits just mentioned. It certainly isn’t humanly possible for him to do so, since, beyond a point, the hop, step or shuffle cannot be performed that fast. A philosopher might wonder if it is nevertheless logically possible for him to do so, but this is like asking about the man and the pie, and need not detain us here! So we have removed yet another barrier between Achilles and the doorway. The vaguely perceived difficulty with the endlessness of Zeno’s sequence proved to be quite genuine but it can also be addressed. The problem doesn’t really arise, after all, but we can see why one might unwittingly think that it does, especially if one contemplates the problem in slow motion! There are likely to be hidden depths in Zeno’s problem but I hope that the above has yielded some idea of how to tackle such a fiendish problem. Everything we have said applies just as well to Achilles and the tortoise, so we might usefully sum everything up in those terms.